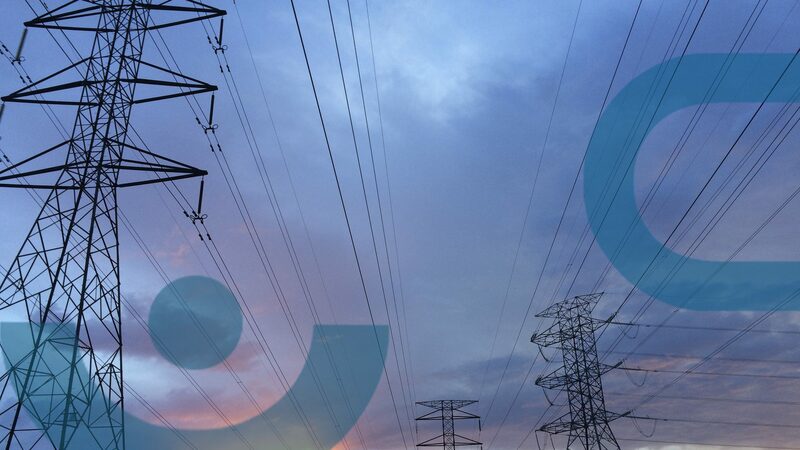 Case studies – Recycle? Reuse? There are a LOT of plans for how local authorities will need to tackle the waste problem in the 2023 Government Waste Strategy for England – with the introduction of schemes new to some – and targets set to be ramped up for all. Local authority-collected waste sent to landfill down over 85% since 2000. Household recycling levels quadrupled since the turn of the century. UK food waste reduced by a million tonnes from 2007-15 (14% per capita reduction). Waste recycled, composted or reused by English local councils in 2016-17 – 11.3 million tonnes, compared to 4.1 million tonnes landfilled. Local councils have a record to be proud of in this area of work, and much of this success (as the Government report acknowledges) is down to behaviour change. At CAN, we have seen many examples of innovative recycling/reusing campaigns that have made an impact on residents’ behaviour through Citizen Reach™ set up in 2015 so local councils could take advantage of digital ‘programmatic’ advertising to get their messages out in a value-for-money and targeted way. Here are three of these campaigns from London borough councils – plus the Government 2023 Strategy plans they could already claim to be working towards. Research showed a low awareness among residents of how to dispose of waste electrical and electronic equipment (commonly abbreviated to ‘WEEE’) – leading to increased waste contamination and fly-tipping. The London Borough of Hackney needed a way to increase awareness of how to recycle in the crucial period after Christmas when gifts and January sales mean more of these goods become surplus to requirements. Sustainability specialists WRAP found recycling rates increase when people are made aware of convenient facilities they can use. 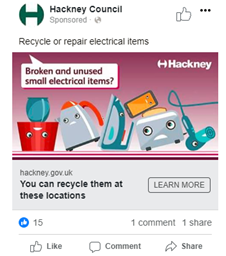 So, Hackney’s campaign creatives told residents where they could recycle their WEEE stuff locally, and also what sort of things it was OK to recycle. The CAN Citizen Reach™ campaign for Hackney, running January to April 2018, aimed online and social media ads featuring these creatives to parents with older children still at home, tech enthusiasts and cooking fans: the groups found most likely to keep replacing WEEE goods. Hackney residents who lived in postcodes close to the council’s Household Waste Recycling Centre were also specifically targeted. Tonnage of waste WEEE products recycled in Hackney increased 127% on the previous year. The stats for just January were even more impressive: with WEEE recycling tonnage in 2018 up 224% on January 2017. When insight from the London Borough of Lambeth showed 18-34-year-olds (particularly those living in shared housing) were more likely than most to throw away food, it suggested a highly targeted campaign – both creatively and digitally – might help reduce waste. Lambeth has a kerbside food waste service, where householders put their scraps in a kitchen caddy and the council then collects the waste for composting from their wheelie bins. In a bid to both increase recycling and reduce wasted food, the council recruited a local resident and keen cook to front its ‘Small change, big difference’ campaign. A series of videos provided tips and hacks on how to get healthy meals out of things that often end up in the bin. 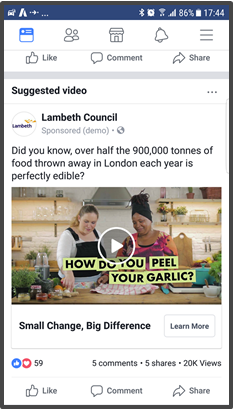 A Citizen Reach™ campaign delivered these videos to 18-34-year-olds in the borough throughout November 2017, placing them among Facebook and Instagram ‘foodie’ content as well advertising on other targeted websites linking to the videos on YouTube. 120,000 people saw the campaign, which delivered 4,805 interactions during the month. Click-throughs from Facebook videos generated an interaction rate of 1.72% (the average is 0.3-0.5%). The niche targeting meant Lambeth Council saw vastly lower costs per engagement than for previous campaigns (down by over 80%). Problem: how to make savings from waste and recycling budgets through changes to non-statutory garden waste collections? 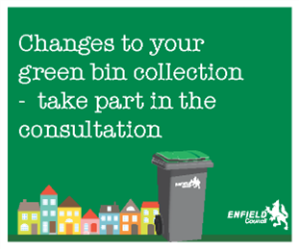 The London Borough of Enfield opted to consult residents on the options of switching to a fortnightly collection or paying £60 a year for a weekly service. Offline consultation had shown residents understood the pressures on budgets but, during green waste campaigns in other local authorities, small groups used social media to vent general service frustrations. A two-phase Citizen Reach™ programmatic campaign aimed to get as many people as possible in the borough directly affected by a change to have their say on the options, and then to push out messages about the decision and its impact to ensure a smooth transition to a new service. People with gardens were likely to be most affected and want to engage on the changes. So, using low-cost digital channels, postcodes with a high proportion of homes with gardens were targeted as well as residents who showed a gardening interest. Residents who clicked but didn’t fill in the consultation survey were re-targeted and nudged towards completing. The decision made by residents was to go fortnightly. Audience data gained from the consultation phase was used so the second phase could get maximum awareness of both the result and the subsequent changes to the service. The consultation reached 96% of Enfield residents and 87% of responses came from digital marketing. There were 1.9million views of the campaign. The 4,683 click-throughs meant a 0.24% rate – eight times the industry average. Negative social media feedback was minimal. Find out how Haringey Council fared when its alternative approach – using its garden waste service for much-needed income generation – was rolled out. And this case study from the London Borough of Ealing demonstrates the power of digital when you need to tell residents about changes to the whole waste service. Do you need to run a behaviour change campaign on recycling? We can help you get better results for your budget through collective buying. The benefits of group buying – where lots of individuals or organisations club together to purchase at scale so the cost per unit is less for each of them – have been gathering momentum over the past few years. Find out more about sharing to save or contact CAN now for more information.